LAKE SHASTA, Calif. - Sixty year old Redding pro Howard Hughes knew there was a decent autumn swimbait bite at Shasta as the final CITGO Bassmaster Western Open of the year approached. He also knew that many of the top pros would be fishing for a handful of big bites. His prowess with soft plastics, however, had him going in another direction. "One day I threw swirnbaits for quite a few hours in the morning," admitted Hughes, "but it just wasn't working for me - I didn't even have any followers.And because the wind began howling in the place I was fishing, I bailed to this finesse-type area that I had stumbled on about three weeks ago." Relatively far up the Pit River arm, but still downstream of the transition between warm reservoir water and cold stream water, Hughes located what he hoped would be enough spotted bass feeding on schools of baitfish to last all three days of the contest . "The bass were feeding on very small shad," explained Hughes, "so I began throwing a 6-inch shad pattern worm and a 5-inch green pumpkin with black flake Senko rigged wacky style. They were both larger imitations, but the fish seemed to be tuned in to them." When the first day of competition came to an end, Hughes brought a five fish limit to the stage that tipped the scales at 8 pounds, leaving him tied with three other anglers for 25th place, and 6 pounds shy of the leader. 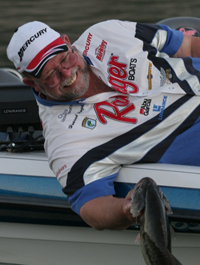 The second day of competition began much the same as the first, with Hughes boating a small 5-pound limit in the morning then running to his Pit arm area in the afternoon . It didn't take long, however, for things to change for the better. "When I rolled into my area, I caught two nice bass on consecutive casts," beamed Hughes. "Then I moved to another bank and hooked a couple more decent fish. I knew I had about 8 pounds again and was about to save a third spot for the final day when I decided that it would probably be better to make sure [that I made the cut]. It only took two more casts for me to catch a 4-1." "Before I came in on the second day, I took my partner to an area where he could drop shot some fish," chuckled Hughes, "and while he was trying to catch his fifth bass in 20 feet of water, I cast up to about 5 feet and caught a 2 1/2-pound smallie with five minutes to spare." Hughes' second day liinit, totaling 12-14, was the second heaviest stringer of the tournament and good enough to move him all the way up to second place and within striking distance of the leader. ''Needless to say, on the third day I went straight to my primary area in the Pit," said Hughes. "On the third cast I caught a 2-13, setting up the day pretty nicely." Despite having another quality round, and 10-8 in the bag, Hughes was anxious as he waited his turn to weigh in. When the dust finally settled, however, he had locked up his first Bassmaster Open victory. Hughes was all smiles as he raised the champion's trophy for the crowd. The key to Hughes' Pit arm pattern was targeting distinct transition zones where the bank changed from dirt to rock or vice versa. Areas where the bank had slid into the lake were also productive. "Transitions between steep and shallow shorelines were also really important," claimed Hughes, "and I would catch fish any time a flat point dropped off and created and edge." "To catch these bass I had to fish real slow," explained Hughes, "and I was really finessing. I was fishing so slowly, in fact, that it usually took me about 30 minuted to cover 100 yards. Any kind of wind and I wouldn't have won this thing. "Triggering a reaction from the bass that were chasing shad meant that I had to shake it [the worm or senko] violently using only light weight - it wasn't just a little doodle-doodle-doodle, but a real pop." Another key to Hughes' success was the use of his electronics to stay on top of baitfish schools. More importantly, however, he used the equipment to prepare for the action before it began. "That Lowrance X-15 has been my saviour," said Hughes, "although I spent most of my time looking at the X 135 I have mounted on the bow. There were so many shad in the area I would see them all the time, but with my electronics I could tell when the bass became active. When I saw the flashes start to go through the schools of shad, I knew it would be getting fun. I could anticipate a fish in about three casts every time." All of Hughes' bass were landed with Fenwick 7-foot medium action HMG graphite rods and Abu Garcia Cardinal C774 spinning reels spooled with 8-pound-test Berkley Trilene XL monofilament. He rigged both his worms and Senkos with Gamakatsu No.2 drop shot hooks.